Interested in social justice but don’t know how to get involved in creating change? Come join Youth Undoing Institutional Racism! We are a group of 16-23 year olds that are committed to creating a liberated society that allows everyone to live their fullest, most authentic life. 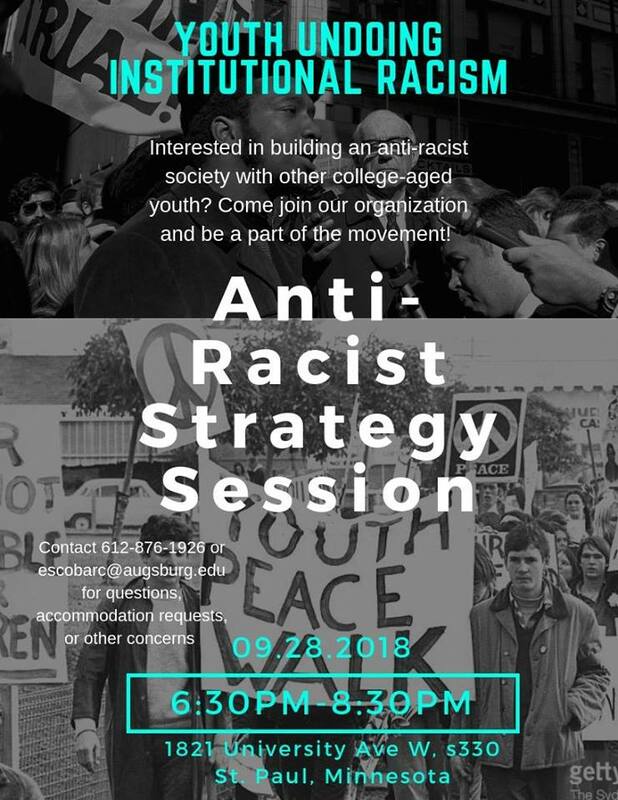 Youth Undoing Institutional Racism will now begin to host our biweekly meetings starting September 28th from 6:30pm-8:30pm (probably will not go this late but the time slot is available if need be!) Snacks will be provided. (Right off the Fairview Stop on the Greenline). Bus tokens are available for folks that request them! Continuing our last session, we will continue building our community strategies towards continuing the Anti-Racist movement in the Twin Cities. It is our belief that in today’s society, it is not enough to simply be “not racist.” In order to create a society that welcomes everyone from all backgrounds, we must be “anti-racist.” In this meeting, we will be discussing our communities, what we see within our communities, what we envision for our communities, and how we can implement the changes we see. We will analyze our power, our privileges, and how they intersect with our oppression. From there we will discuss building our next community trainings. Hope to see you there! If you have any questions, accommodation requests, concerns, or comments, contact 612-876-1926 or escobarc@augsburg.edu.